Philadelphia, PA (February 2018) – Non-profit literary magazine Philadelphia Stories has named a winner of the 2018 Sandy Crimmins National Prize for Poetry. With her poem “Spear Side (Patrilineality),” Chelsea Whitton has won the prize of $1,000, publication, an invitation to submit a chapbook to be considered for publication by PS Books, and an invitation to the Lit Life Poetry Festival, co-sponsored by Philadelphia Stories and the Montgomery County Poet Laureate Program. [this] crown of 5 loose sonnets…[evokes] a rich and complex understanding of the gifts and burdens…passed along from father to child from generation to generation. [Whitton offers] both tenderness and sense of tragic foresight, [as well as] an element of uncertainty or instability…as the poem gestures meditatively toward the nature of grief, and the emotional and psychological exhaustion it creates over time…. [Whitton’s poem] depicts…the inheritance from the father’s side: a gift of love across generations in the form of hard work and persistence. The poem…[acknowledges] in the final section that not all fathers are heroic or even good. Nevertheless, the poem reminds us that our familial heritage gives us our bearings, grounds us in a sense of history, and helps us navigate the present skies, however precariously the stars may have been arranged by those before us. choosing a winner, the runners up, and the honorable mentions was much harder than I could have anticipated, in large part due to the quality and depth of the submissions received. This year’s pool of submissions included a wide range of topics that were–by turns–personal, public, allegorical, and universal. The content of the poems ranged from social media to mortality to bodily harm. Poems about mothers, fathers, uncles, lovers, and the gifts and burdens of family histories. Poems grappling with the trauma of constant messaging that tells you that your skin color and hair texture are wrong. Poems about the brutal murders of unarmed African American boys. Poems that drew me in with their intimacy, and those that elevated human experience to the level of archetype….Each poem had a distinct gift to give in terms of both craft and content, making my job of selecting just a few pieces a very challenging task. In addition to the winner, our judge selected three runners up to receive $100 each as well as publication in the magazine, a chance to submit a chapbook to be considered for publication by PS Books, and an invitation to attend and read at the Lit Life Poetry Festival and Crimmins celebration on April 7. Additional poems from Alicia Askenase and Cortney Lamar Charleston will be published at PhiladelphiaStories.org. Philadelphia Stories celebrates these winners and Poetry Month at the Lit Life Poetry Festival presented by Philadelphia Stories along with the Montgomery County Poet Laureate Program at Rosemont College, April 7. Attendees will enjoy a keynote from our judge, Dilruba Ahmed, master classes with Ahmed and poet and journalist John Timpane, and a series of panels discussing and reflecting on a variety of ideas related to poetry. We will celebrate the winning poets of the Crimmins contest and the new poet laureate of Montgomery County in an afternoon reception which will be free and open to the public. For more information about the prize or the awards ceremony, please visit philadelphiastories.org/litlife-poetry-festival. The seventh annual Sandy Crimmins National Poetry Prize is a national poetry contest made possible by the generous support of Joseph Sullivan. The prize is named for his late wife, who served on the Philadelphia Stories board from 2005 to 2007. Sandy was a poet who performed with musicians, dancers, and fire-eaters at bars, bookstores, and festivals. Her short stories and poems were published in a variety of journals, and her book, String Theory, was published by Plan B Press. 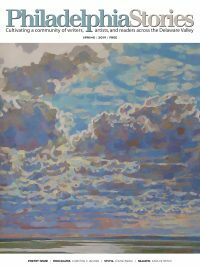 Philadelphia Stories is a nonprofit literary magazine that publishes literary fiction, poetry and art from Pennsylvania, New Jersey, and Delaware and distributes free of charge to a wide demographic throughout the region. Our mission is to develop a community of writers, artists and readers through the magazine, and through education programs, such as writer’s workshops, reading series, and other affordable professional development programs for emerging writers and artists. Philadelphia Stories celebrated its 10th Aniversary in 2014.